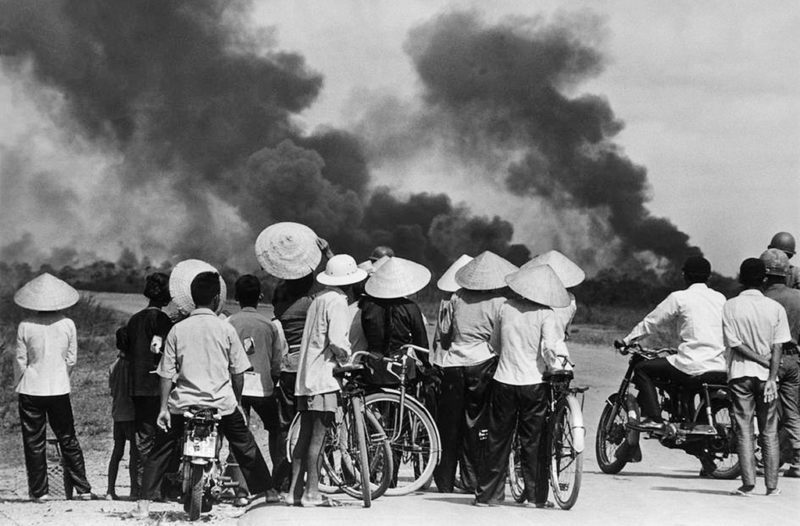 It was 1969, and the American War on Vietnam seemed unending. Mass outrage over the war had spilled into the nation’s streets and campuses — outrage over the rising heap of body bags returning home, over the never-ending spree of bombs that barrelled down from US planes onto rural villages, with the images of fleeing families, their skin seared by napalm, broadcast across the world. Hundreds of thousands of people had begun to resist the war. The fall of 1969 saw the historic Moratorium protests, the largest protests in US history. But while the passion and determination of the antiwar movement was strong, some felt that hard knowledge about the power behind the war machine was lacking. Who was manufacturing and profiting off of the bombs, planes, and chemicals used in Vietnam? Where did the war machine — its factories, its research labs — exist in the US? In what states, and in what towns? Who were the companies benefiting from and fueling the war? If organizers and the booming antiwar movement could get hold of this information — a wider and deeper knowledge of the the money and corporate power behind the war — the movement could become even stronger, able to strategically target the different components of the war machine across the country. This was the context in which National Action/Research on the Military-Industrial Complex — or NARMIC, as it became known — was born. NARMIC wanted to research the power and money behind the defense industry and get this research into the hands of peace activists who were resisting the Vietnam War so they could fight more effectively. They wanted — as they put it — to “fill the gap” between “peace research” and “peace organizing.” They wanted to do research for action — hence, their use of the term “action/research” to describe what they did. Throughout its history, NARMIC staff and volunteers didn’t just sit quietly in a room and analyze sources, isolated from the rest of the world. They worked closely with local organizers. They took requests from activists to look into companies to target. They trained movement people to do their own research. And they compiled a big library of documents for anyone to use, along with a collection of pamphlets, reports, slideshows, and other tools for organizers. The story of NARMIC, like the story of the SNCC Research Department, is part of the crucial but hidden history of the role of power research in the history of US protest movements. This message — that moral anger against oppression needed to be matched by an understanding of how economic systems create and sustain that oppression — animated NARMIC throughout its life. NARMIC was based in Philadelphia. Its early staffers were mostly recent graduates from small liberal arts colleges like Swarthmore, outside Philadelphia, and Earlham, in Indiana. It operated on a shoestring budget, with its young researchers working on “bare subsistence wages,” but immensely motivated to do solid research that could help the antiwar movement. After the group formed in 1969, NARMIC set to work researching the defense industry’s ties to the Vietnam War. This research resulted in two early publications that had a huge impact within the antiwar movement. The first was a list of the top 100 defense contractors in the US. Using data available from the Department of Defense, NARMIC researchers meticulously put together rankings that revealed who the nation’s biggest war profiteers were and how much these companies were awarded in defense contracts. The list was accompanied by some useful analysis from NARMIC about the findings. The top 100 defense contractors list was revised over time so that organizers would have up-to-date information — here, for example, is the list from 1977. This list was part of a larger “Military-Industrial Atlas of the United States” that NARMIC put together. The second major early project by NARMIC was a handbook called “Automated Air War.” This publication broke down into plain words the different kinds of weapons and aircrafts that the US was using in its aerial war against Vietnam. It also identified the manufacturers and weapons producers behind them. But the “Automated Air War” went even further in helping antiwar organizers. In 1972, NARMIC turned the research into a slideshow and filmstrip with a script and images — images of corporate logos, of politicians, of weapons, and of injuries inflicted on the Vietnamese by the weapons being discussed. At the time, this was a cutting-edge way to engage and educate people on the topic of the war and the weapons and defense contractors behind it. NARMIC would sell the slideshow to groups around the US, who would then stage their own showings of it in their own communities. Through this, NARMIC disseminated the results of its power research all over the country and contributed to a more informed antiwar movement that could develop a keener sense of strategy about its targets. Through all this, NARMIC also built an impressive data bank of information that it could draw on for research. NARMIC explained that its office contained “clippings, articles, research notes, official reports, interviews and independent research findings” on the defense industry, universities, weapons production, domestic counterinsurgency, and other areas. It subscribed to industry journals and directories that few people knew about but which contained valuable information. NARMIC made its data bank available for any group or activist who could make it to the Philadelphia office. But far from being a top-down think tank, NARMIC’s reason for existence had always been to do research that connected with and could strengthen the efforts of antiwar organizers. The group lived out this mission in different ways. We would get phone calls from some of these groups saying, “I need to know about this. We’re having a march tomorrow night. What can you tell me about Boeing and its plant outside of Philadelphia?” So we’d help them look it up… we would be the research arm. We were also teaching them how to do the research. Indeed, NARMIC made a point about its desire to train local organizers in how to do power research. “NARMIC staff is available to “do-it-yourself” researchers to help them learn how to use data bank and library material and how to compile information relevant to their projects,” the group stated. 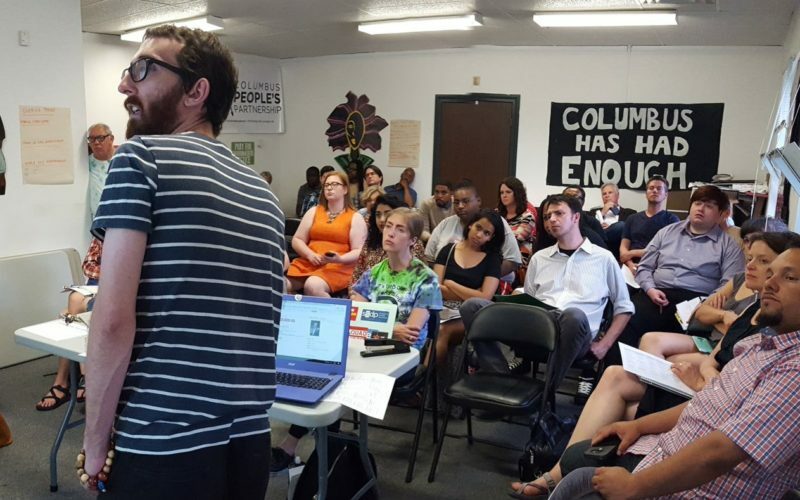 Philadelphia: NARMIC researchers helped antiwar activists get information about GE and its Philadelphia plant that the movement used in its organizing. GE manufactured parts for antipersonnel weapons that were being used against Vietnam. Minneapolis: Activists formed a group called the “Honeywell Project” to protest Honeywell, which had a plant in Minneapolis that manufactured napalm. NARMIC helped organizers to learn more about how napalm was developed, who was profiting off it, and how it was being used in Vietnam. In April 1970, protesters successfully shut down Honeywell’s annual meeting in Minneapolis. 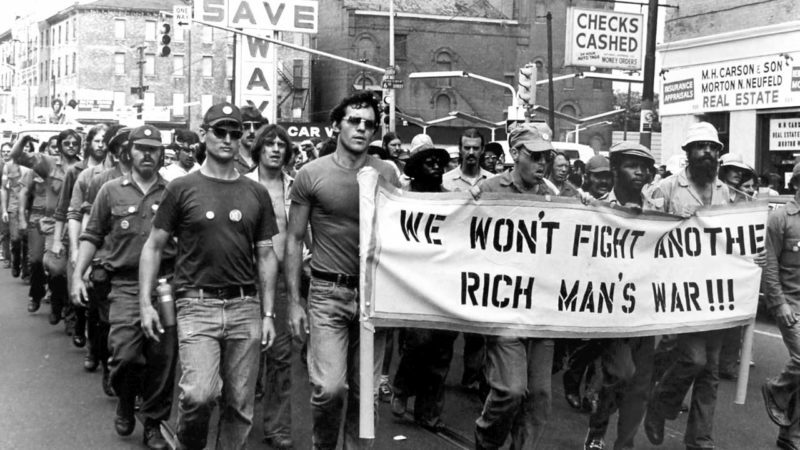 Vietnam Veterans Against the War (VVAW) marches through the streets around 1970. 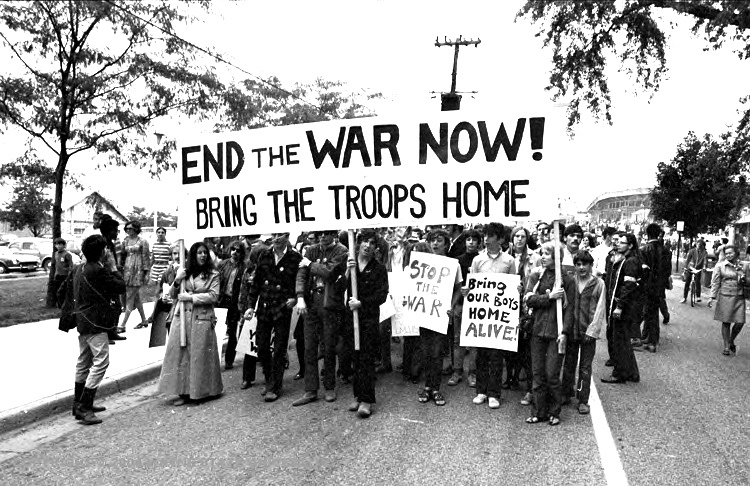 VVAW and NARMIC both worked together and played a role in helping to end the US war in Vietnam. After the Vietnam War ended, NARMIC shifted towards new research areas. Throughout the late 1970s and into the 1980s, it released major projects on different facets of US militarism. Some of these drew on NARMIC’s experiences from the Vietnam War, such as slideshows it made to accompany research on the military budget. NARMIC also published reports on military intervention in Central America and the US role in propping up South African Apartheid. All the while, the group continued to work closely with organizers involved in protest movements around these topics. One of NARMIC’s major contributions during this period was its work on nuclear weapons. These were years — the late 1970s and early 1980s — where a mass movement against nuclear proliferation was taking hold in the US. Working in collaboration with different organizations, NARMIC put out vital materials on the risks of nuclear weapons and the power and profiteering behind them. For example, its 1980 slideshow “Acceptable Risk? : The Nuclear Age in the United States” explained to viewers the dangers of nuclear technology. It featured nuclear experts as well as testimony from survivors of the Hiroshima atomic bomb, and it was accompanied by copious documentation. By the mid-1980s, according to one of its researchers, NARMIC fell apart due to a combination of factors that included funding shortfalls, the exiting of its founding leadership, and a withering of organizational focus since so many new issues and campaigns were arising. But NARMIC left an important historical legacy, as well as an inspiring example for power researchers today who seek to advance organizing efforts for peace, equality, and justice. The story of NARMIC is an example of the critical role that power research has played in the history of US social movements. NARMIC’s research during the Vietnam War, and the way this research was used by organizers to take action, made a dent in the war machine that contributed to the end of the war. It also helped educate the public about the war — about the corporate power profiting off of it, and about the complicated weapons systems the US was using against the Vietnamese people. Militarism doesn’t happen in a vacuum. It doesn’t just grow on its own. There are reasons why militarism grows and thrives in some society, and it’s because of the power relationships and who’s profiting and who’s benefiting… So it’s important to not only know… what is this militarism, and what are the components… but then who’s behind it, what is its pushing force?… You can’t really look at militarism or even a particular war… without really understanding what the propellants are, and it’s usually pretty well hidden. Indeed, NARMIC made a broader contribution to highlighting the military-industrial complex and making it a wider target for dissent. “On the face of it,” wrote NARMIC in 1970, “it seems absurd that a tiny group of action/researchers can do very much to counter the MIC giant.” But sure enough, by the time NARMIC disbanded, war profiteering and military intervention were viewed skeptically by millions of people, and movements for peace had developed an impressive research capacity — which NARMIC helped build, with others — that still exists today. The NARMIC project was an invaluable resource from the early days of serious activist engagement with the intricate and threatening military system in the US and around the world. It was also a major stimulus for the broad popular movements to constrain the terrifying threat of nuclear weapons and violent intervention. The project demonstrated, very effectively, the crucial importance of careful research and analysis for activist efforts to address the severe problems that must be at the forefront of our concerns. But maybe most of all, the story of NARMIC is another story about the possibilities of movement research — how it can work hand in hand with organizing efforts to shed light on how power works and help identify targets for action. The legacy of NARMIC is alive in the movement work that we do today. What they called action/research, we might call power research. What they called slide shows, we might call webinars. As more and more organizers today are embracing the need for power research, it’s important to remember that we stand on the shoulders of groups like NARMIC. Interested in learning more about how power research and organizing can work together today? Register here to join up with Map the Power: Research for the Resistance. The AFSC also continues to look into corporate complicity with human rights abuses. Check out their Investigate website.